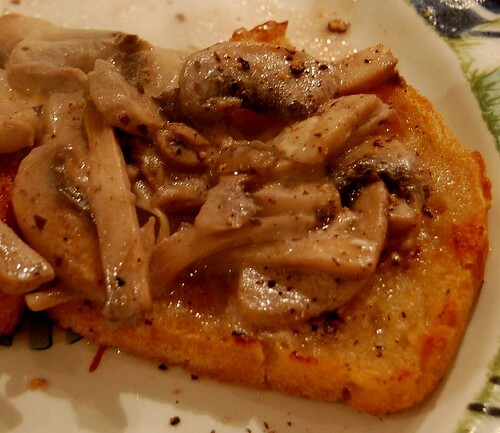 … aka mushrooms on toast. Don’t let it be said that I’m a procrastinator! Here’s my first dish from Delicious Days, my cookbook challenge for this year. Supplies were low and dinner improvised, but I found some mushrooms in the fridge, so while the “real” dinner was cooking I opened a bottle of wine and made Nicky’s mushroom crostini: a 10-minute job. We didn’t have any chives, which would have made them look prettier even with my poor photographic skills. We didn’t have any Marsala either, but we don’t do things by halves in this household, and Christmas comes but once a year — in went a glug of Warre’s excellent vintage port, bought at the airport last week. Well, it was only a couple of tablespoons. The completed sauce was poured over a few slices of my home-made 5-minute bread, and we enjoyed them with a glass of wine by a cosy log fire. The mushrooms and sauce were delicious. Nicky says the bread should be fried, which I did, in olive oil, and then drained on kitchen paper, but some of it was a bit greasy. Next time I’ll toast or bake it. Hi Veronica! Well done for getting started! The mushrooms look delicious, and I imagine would be nice on toasted or grilled ciabatta too. Thanks for the link to my blog too – it is great that others want to do this challenge too. I look forward to hearing about their experiences too. Good luck on the cookbook challenge. I have thought about it, but it seems a bit too limiting. I have so many cookbooks, and only manage to try out one or two new recipes a week. I’m trying to focus on one every two weeks, though. The crostini looks nice — I love mushrooms, yum. That looks sooooooo delicious!! And fried bread just takes it completely over the top!